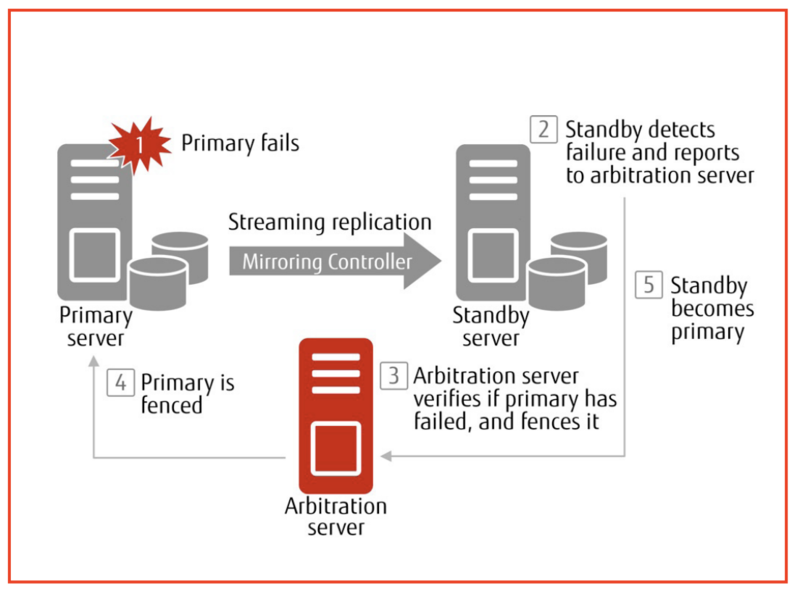 See how the Mirroring Controller in FUJITSU Enterprise Postgres works to ensure business continuity when an abnormality is detected. In our demanding world of digital business, users expect IT services to always be available and function as anticipated. However, we all know things can, and do, go wrong. That's why you need technology such as the Mirroring Controller found in FUJITSU Enterprise Postgres. Continuity is crucial, and data must flow. Enter Mirroring Controller, just one of the enhanced features inside FUJITSU Enterprise Postgres. Mirroring Controller is key in maintaining the high availability, business continuity and integrity of your data. When an outage occurs, it's imperative that business operations be redirected quickly and automatically to an alternate database that contains current and consistent data. Databases that operate within mission-critical systems typically run in an architecture with purpose built redundancy ensuring that stability can be resumed while avoiding irreversible loss of data. FUJITSU Enterprise Postgres adopts such an approach by simplifying the setup of a multi-instance replication cluster that replicates data by streaming it from the primary to standby instances. If the primary server fails or becomes unavailable, client applications (online or batch) can be automatically switched to a standby instance to achieve seamless availability of service and maintain business continuity. If an abnormality is detected, Mirroring Controller performs automatic switch/disconnect — if the primary server fails, processing is automatically switched to the standby server to ensure operational continuity, and the primary server is disconnected. You also have the option of switching from the primary server to the standby server manually should you prefer the Mirroring Controller to not do so automatically. The Mirroring Controller installed on each database server contains agents that communicate with each other to continually monitor server processes and operating system, network, and disk state. They even monitor the actual Mirroring Controller processes themselves. Mirroring Controller is one of the features included in FUJITSU Enterprise Postgres, and another way to harden your PostgreSQL for mission-critical data. Ensuring the continuity of critical business systems has never been more important. Contact us to discuss how FUJITSU Enterprise Postgres can help your organisation achieve success in today's digital age. This is one of a series of blogs in which we highlight a range of features in FUJITSU Enterprise Postgres that extend the reliability and performance of PostgreSQL, the open source database management system on which it is based. These features provide enhanced operational continuity, greater security and improved performance.